Today at your Adda, we have someone who loves to share the new tips and tricks about the digital world. P. Chandra, the man behind Quick Online Tips, the popular blog regularly publishing technology news, practical blogging tips, social media buzz and useful computer software in an exclusive interview with us. The blog has indeed come a long way from when it was started in 2004. In 2014, it has won the Best Blog award in the Technology & Internet Category at WIN ’14. Q: What inspired you to start a blog on ​technology? A: I always loved to share cool stuff, tips and tricks with my friends. So when Blogger became popular in 2004, I created a blogspot blog called ‘Quick Online Tips’ so that I could share my experiences with a larger audience. As the readership grew quickly, I knew this was what I loved to do. Darren Rowse was the Problogger then, and his work inspired me to continue blogging. ​Q: B​log​ging​ in 2004 ​ to Blogging in 2014​. ​How has blogging evolved over the years? What are the significant changes that you have seen in the last 10 years? A: In 2004 – There were few tech blogs then. Big sites like Techmeme, Techcrunch etc. were getting started to go big time. It was easy to get an interactive audience, especially if you blogged local content. Many bloggers blogged as a hobby rather than as a professional business. Those were the days when a single link on Digg, Slashdot, Delicious, Stumbleupon could crash servers in minutes and get your thousands of readers in days! In 2014 – Blogging is mainstream and everyone wants to blog. WordPress is more popular than ever, and most blogging platforms have made blogging super easy and feature rich. While the days of Digg are gone, social media rules and any controversial content can go viral in no time. The days of anonymous blogging is gone and now bloggers want recognition for their hard work. The prospect of earning a few dollars by the side with programs like Adsense is attracting thousands of bloggers to share their expertise. It’s easier than ever to start a blog and make money online. Q: Give our readers 5 handy tips about blogging. WordPress is the best way to start a professional blog. There is no substitute for great original ideas and content. If the content is great, the traffic will come. It takes time. Never try to trick search engines like Google. ​Q: How have you built traffic on your website over the years? What w​ere your learnings as you evolved into a successful blogger? A: In the early years, getting your tips featured on popular blogs like Lifehacker, would drive many readers. A popular link on Digg, Delicious could drive thousands of visitors in a day. Now getting those traffic bursts is difficult. Google penalties over the years have made bloggers more aware about best search engine practices – guestblogging, link exchanges, paid links, infographics, sponsored reviews are all considered bad practices now. Now building traffic is more about building a brand, developing a huge social media following and publishing great content that readers love, want to come back to and share with their friends. Q: You have a separate tutorials section on your blog. Could you tell us more about this initiative by you and how exactly can your readers benefit from here? A: The tutorials section features helpful tips we discover everyday. My blogging style is all about sharing experiences in experimenting with our blog, web tools and gadgets. We then sharing these learnings with our readers thereby help them bypass the learning curve we took. Q: Which is your latest favourite electronic gadget and why has it made it to the top of your list? A: My favorite gadget right now is the Chromebook. I know many people differ and find it an underpowered laptop with limited features. My Chromebook is my primary blogging gadget and I could not be happier. Start and closes in seconds with a long battery life. It is the best way to access the full Google ecosystem while switching all activities online. I never need to buy a bulky expensive laptop again, as all my work activity is now online, which I did not think was possible earlier. Q: You won the Best Blog Award for the Technology & Internet Category by BlogAdda at WIN. How did you and your loved ones react to this? A: I am very grateful to BlogAdda judges for considering our blog worthy of this award and we do hope to live up to your expectations. The attitude of friends and family has changed and they now take my blogging habit more seriously than before and treat it with more respect. Q: Let us go back to your childhood…Tell us some memorable incidents about your school going days? A: My first computer in childhood was a VIC 20 which has a 20KB (not GB!) expandable memory. I learnt BASIC programming and my next super powerful computer ZX Spectrum+ had a huge 128KB memory. I used to write programs and play them through those bulky cassette recorders – and remember how difficult how single missing character error would make the whole program not work. I built my first websites on Tripod and Geocities. Q: Tell us five things that feature on your bucket list. Q: What special can we expect to see from Quick Online Tips in the near future? A: We are going to expand into development of web tools, apps and online services. We hope to share more learning experiences as we stumble along the way to help others succeed doing the same. Q: Other than involvement with technology and the latest gadgets, what are other activities that you like to involve yourself in? A: I love reading and coding. I am learning advanced PHP, jQuery to develop superior themes / plugins. I am also experimenting with development of chrome extensions / web apps. Q: How important is it for the blogger to interact with their readers? Do you respond to all the comments that you receive? A: It is very important to interact with your readers. But as the years pass by, more and more comments posted are spam. People just post comments to get a backlink. You can find better interactive content on sites that only allow members or social media logins to allow comments. Tools like Disqus, LiveFyre can also enhance the commenting experience and keep readers coming back for more interaction. Q: Do you agree with the notion that technology is expensive? A: Even if technology is expensive, we still need it. I have a six year old Macbook, it costed 2 times more than other laptops at that time -and it still runs faster and smoother than my latest laptop. It’s better to recognize our needs before we put in money in features which we might never use. New top end models are always expensive, but users should see if there is value offered in the new features and they actually need those features. Q: What is the most gratifying aspect of blogging according to you? A: When a tip gets particularly appreciated and helps out lots of people, it is very gratifying. The thankful comments and kind words just make your day.But site traffic is essential to deliver your message to a larger audience who need help solving the same problems. The advertising income is also motivating till it keeps rising. Q: What is the future of technology blogging in India according to you? A: Blogging is getting more popular in India and there might be more bloggers in India than in any other country soon. There is lot of scope in tech blogging compared to other niches as there is exciting breaking news happening everyday in the technology space. Original content will always rule and top bloggers will keep drawing more traffic. Serious bloggers who work hard will rise more and it will be more about creating a brand around your blog. 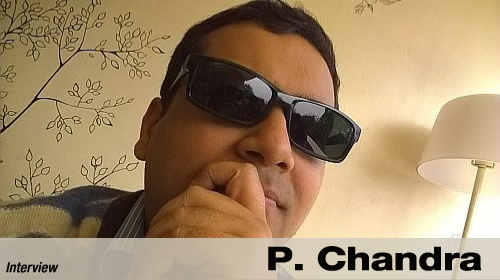 Connect with P. Chandra: Blog, BlogAdda, Twitter, Facebook, Google+, Pinterest. Thank You for an awesome interview! For all those who missed #WIN14, you can relive it through the photos! Bloggers, we hope you enjoyed reading this Interview with P. Chandra where he tells us how he started Quick Online Tips and talks about the future of technology blogging in India. We look forward to your feedback about this interview. Previous PostPrevious Tangy Tuesday Picks – May 20, 2014. Next PostNext WOW – Magic!